Lithium has a lot of interest and needs for investment. Currently, demand is growing at 15-20 percent per year which will likely persist for several years. If there is any consolidation, it will likely appear in the junior space. Cobalt is still needed for energy density in batteries. The question is how much per battery is required and what will be the winning chemistry. Battery tech is evolving, and many companies are working on cobalt lite cathodes. They intend to minimize the overall costs. Less cobalt likely means an increased quantity of nickel in batteries. Battery recycling is an area that will probably grow as an enormous amount of batteries enter the market over the next ten to fifteen years. There is an effort to reduce the need for cobalt from the Congo. Cobalt demand is still going to increase two to three times. Longer-term the price will rebound. Vanadium seems to be reverting to the mean as it a long-term play. The majority of vanadium mined is a by-product and not a pure play. The demand for steel drives the overall market. A good case continues for vanadium-redox batteries in grid storage, and unlike lithium-ion, these batteries will not degrade. 1:10 – Outlook for lithium. 3:45 – Consolidation with lithium companies. 6:20 – The future demand for cobalt. 11:00 – Vanadium markets long-term potential. 15:10 – E.V. Technology is not new but has advanced. 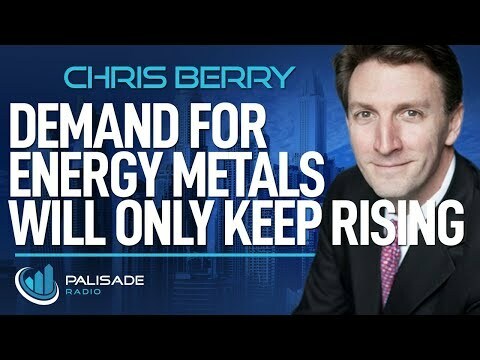 • Energy metals will drive the interest in commodities going forward. • Investors should want to watch Lithium, cobalt, copper and possibly vanadium. • Battery chemistry will continue to evolve. Chris has been an independent analyst since 2009 with a focus on Energy Metals including lithium, cobalt, graphite, vanadium, and rare earth. He is Founder and President at House Mountain Partners. His research provides strategic insights to institutional clients and has a specific focus on how disruptive trends in energy, strategic metals, and technology create opportunities. Before shifting focus to the analysis of these trends, Chris gained twelve years of capital markets experience on both the buy side and sell side. He speaks at conferences in North America, South America, Europe, and Asia and is frequently quoted in the press including the Financial Times providing insights around raw material supply chain dynamics. Chris holds a Master of Business Administration in finance with an international focus from Fordham University, and a Bachelor of Arts in international studies from The Virginia Military Institute.